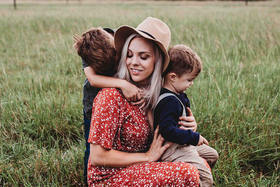 Architect designs life in the country for a city family. 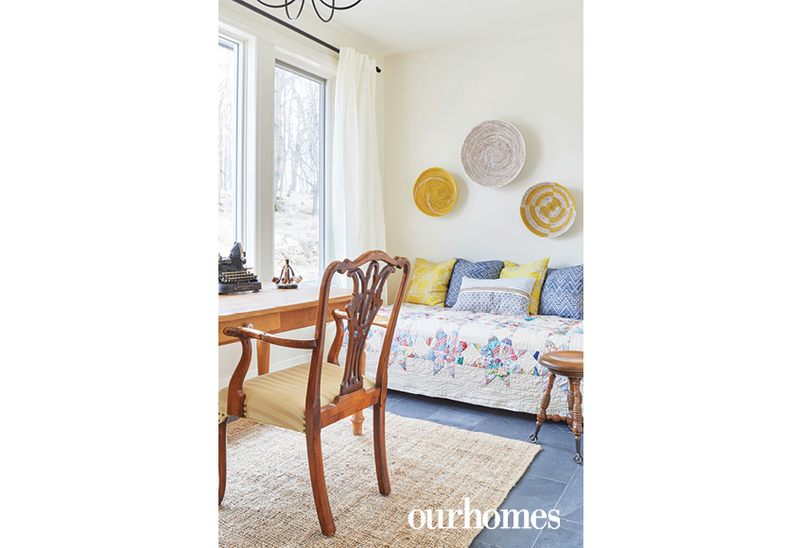 A version of this article originally appeared in the Summer 2018 issue of OUR HOMES Wellington County, Orangeville, Caledon, p.60. Find local businesses in our Wellington directory. 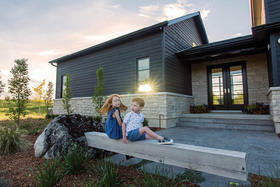 Carol and Maarten, a professional couple from Toronto, spent over five years scouring the Township of Mono before finding the ultimate setting for the country home they now call SplitRok, named after the unique Bruce Trail geological features that surround it. 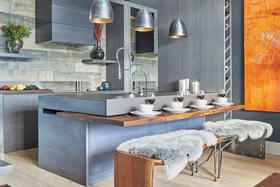 Their real estate agent, Karen Lay of Right At Home Realty Inc., Brokerage, connected them with Toronto architect Harry Morison Lay, who came highly recommended, although not related. The couple remembers meeting with Harry on the side of the hill where they articulated their hopes, wants and needs for the country home. 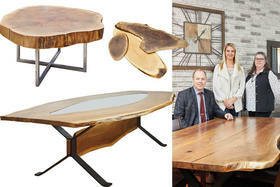 Harry says he always counsels his clients that they not hurry the design stage. “You have one chance to get it right – the time invested in the planning stage is crucial,” he says. 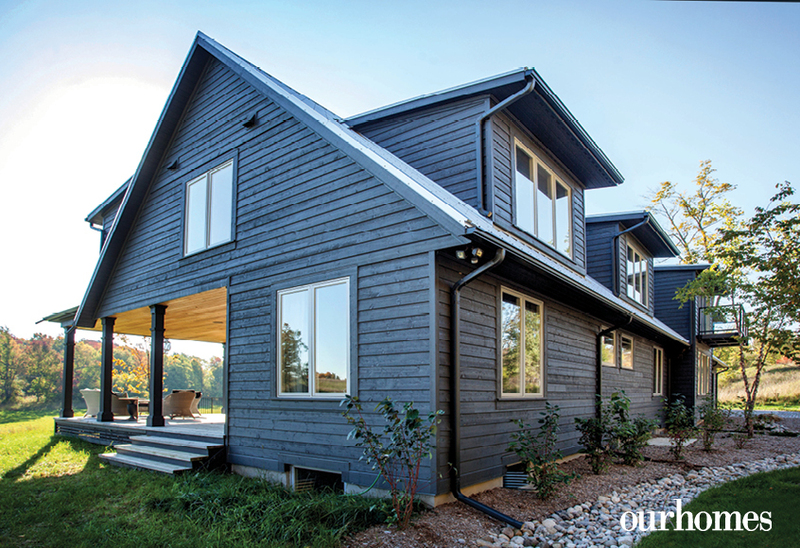 The design was inspired by the style of a bank barn, incorporating a low building built into the hillside and bisected by a breezeway that serves as entryway to the meadow. Rudy Vandenberg of Classic Renovations was hired as general contractor. Harry comments, “Peeling away the hillside, Vandenberg extracted tons of blonde limestone that now appear as a feature in the front garden. The large entryway accommodates several people at a time and features a long bench and hooks along the wall with an earthy slate floor from Caledon Tile Bath & Kitchen Centre. 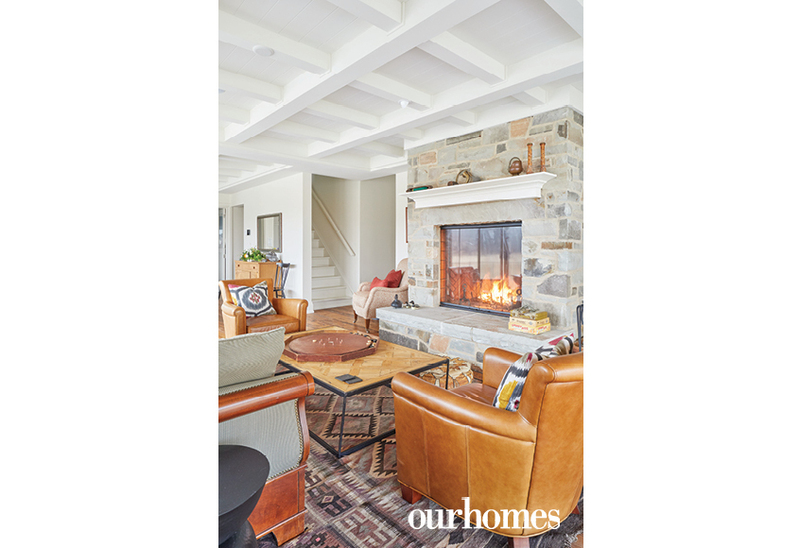 A stone fireplace in the living room by Kema Masonry is a focal point and a natural gathering place in the cooler seasons. 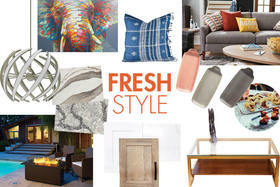 Patterned rugs warm the wood floor and add texture to the cosy décor. The kitchen offers a panoramic view of the meadow. The large island is topped with the same hemlock as is the floors. A winding staircase installed by Stair Wayz leads to the second floor that is still a work in progress. Exterior photos by Nat Caron. The bank barn design for SplitRok was the vision of Architect Harry Lay. Exterior photos by Nat Caron. 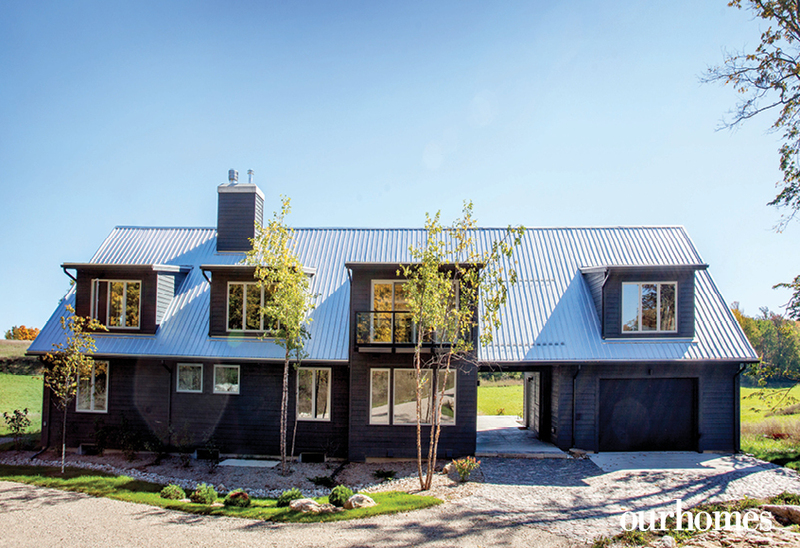 The design of the building suits the country setting and pays homage to the land it occupies near the Bruce Trail in the Township of Mono. Exterior photos by Nat Caron. The home has fantastic views of the meadow from the north deck at sunset. 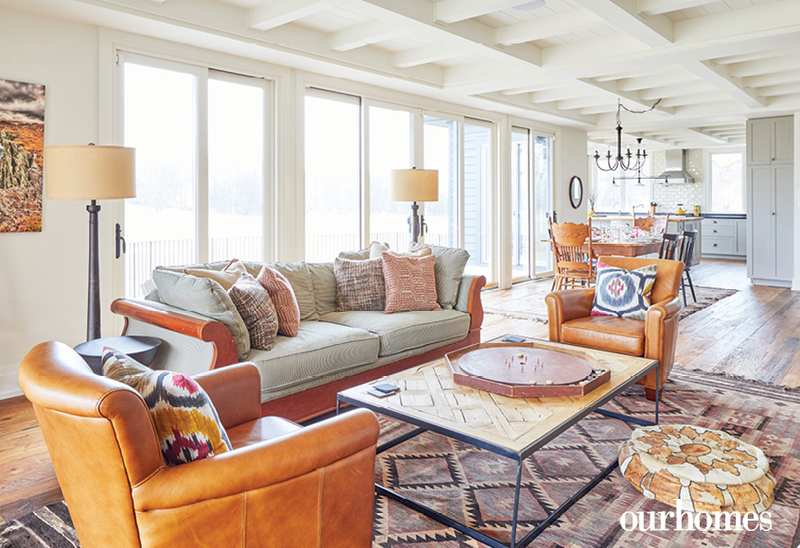 Floor-to-ceiling windows and doors open to the main deck and overlook the meadow. 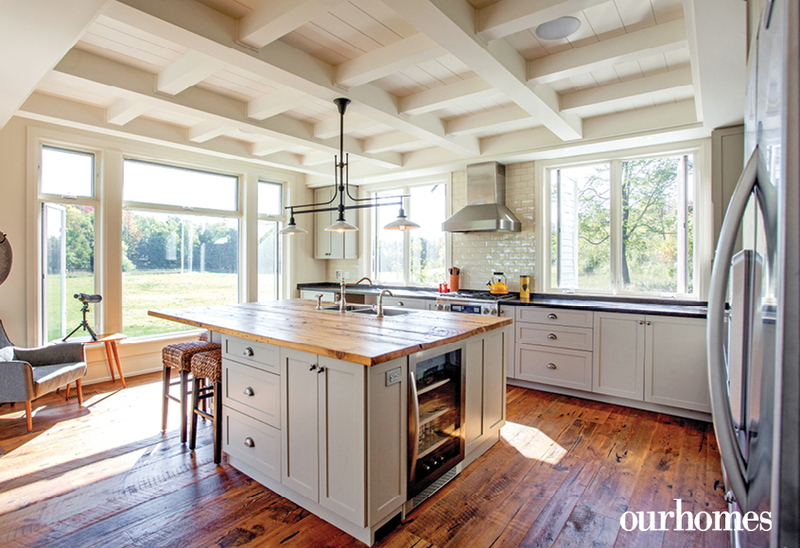 The open-concept kitchen and living room are flooded with light. The spectacular stone fireplace by Kema Masonry provides a focal point for the living room. 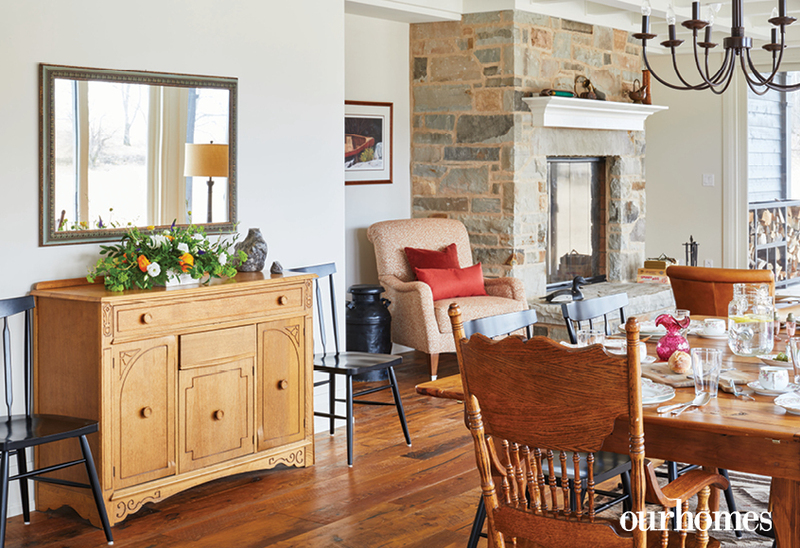 SplitRok is rich with family heirlooms like the sideboard from a grandparents’ farmhouse. Salvaged hemlock floors with saw marks and nail holes intact add patina and a seamless transition from the dining room to the kitchen. 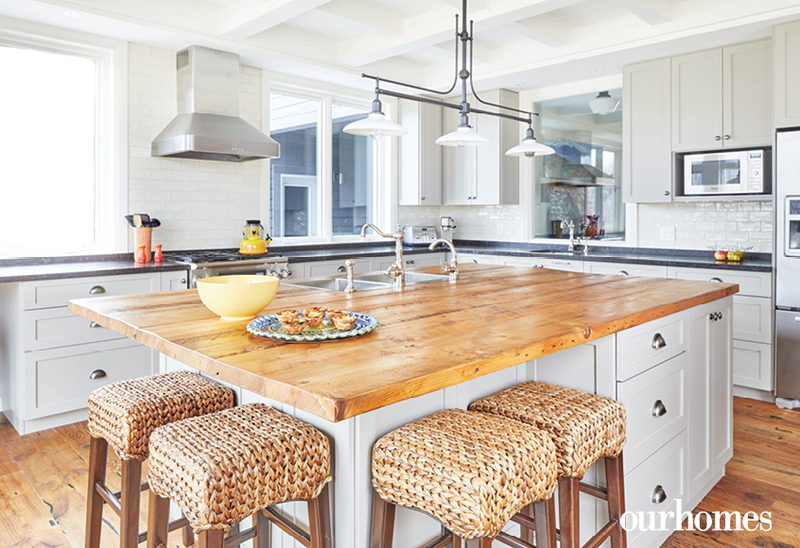 The large kitchen island is topped with hemlock, the same wood as the home's floors. The main countertops are a dark stone. A clever interior window into the entry at the back of the kitchen allows the family to see who’s coming and going. 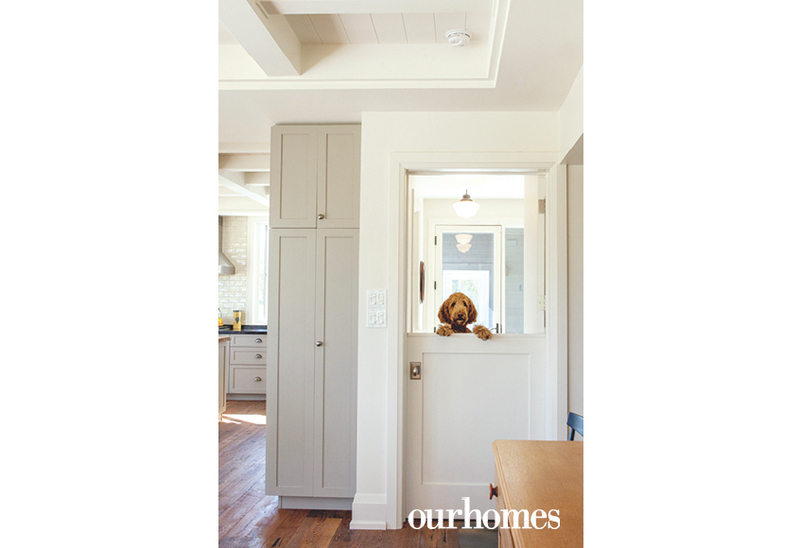 A Dutch door to the mudroom/entry keeps the family pet on the “right side” before paws are cleaned. 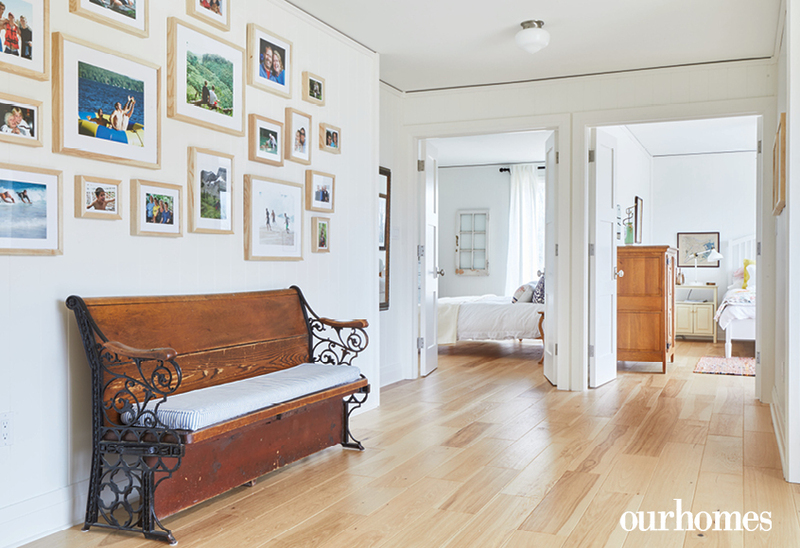 An antique bench, gifted by architect Harry Lay anchors a family memory wall in the second-floor sitting room. 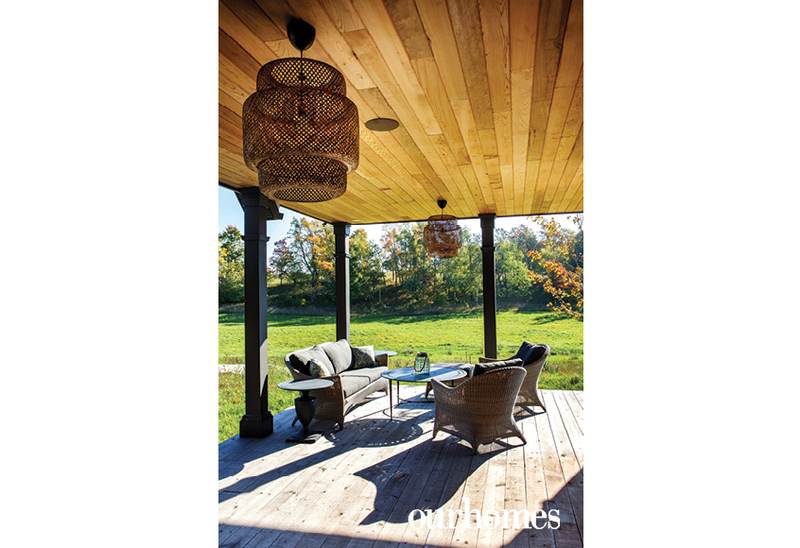 The home office space offers a spectacular view of the front landscape and the daybed has become a favourite napping space for guests – much like a sleeping porch at the cottage. The owners had the windows in the master bedroom designed so they could see what’s happening outside without getting out of bed. 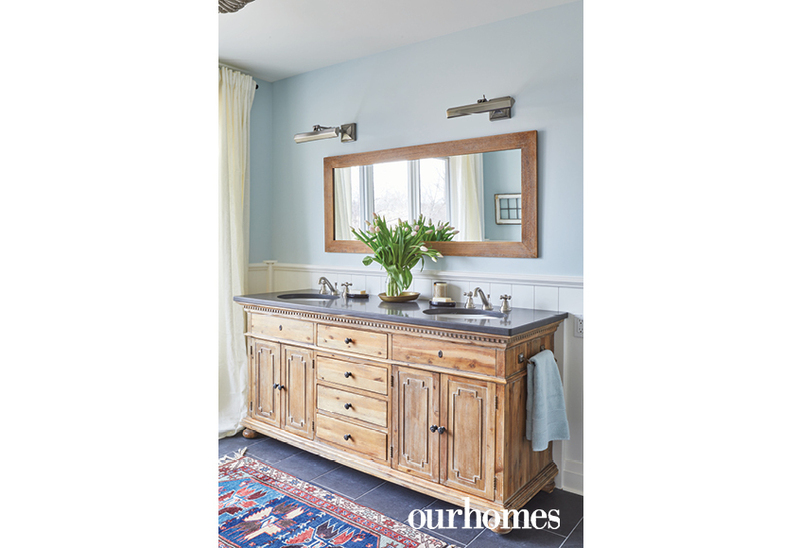 The rustic vanity was purchased before the house was built. The brilliant blue claw-foot tub has black feet. 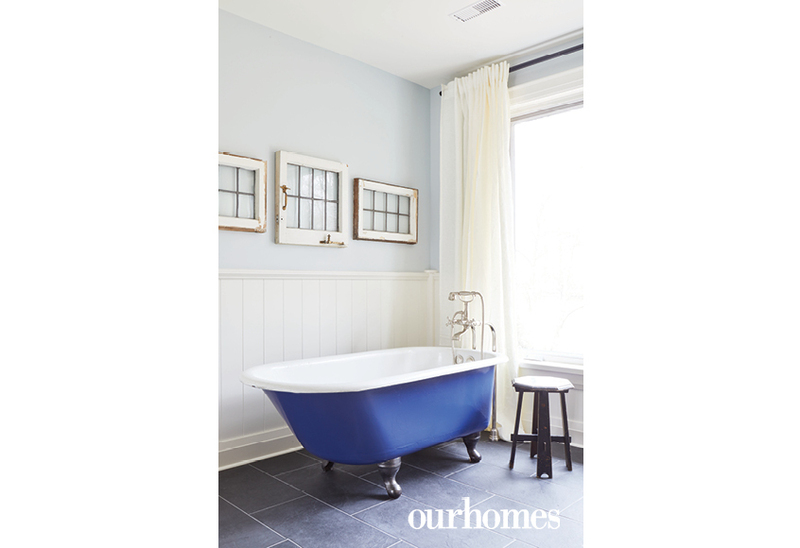 A charming display of leaded glass windows above the tub was taken from the couple’s Toronto home. 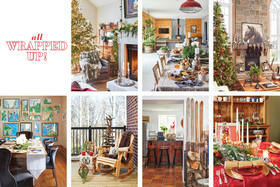 Every corner and room in the house is designed with a full, but private view of the landscape. 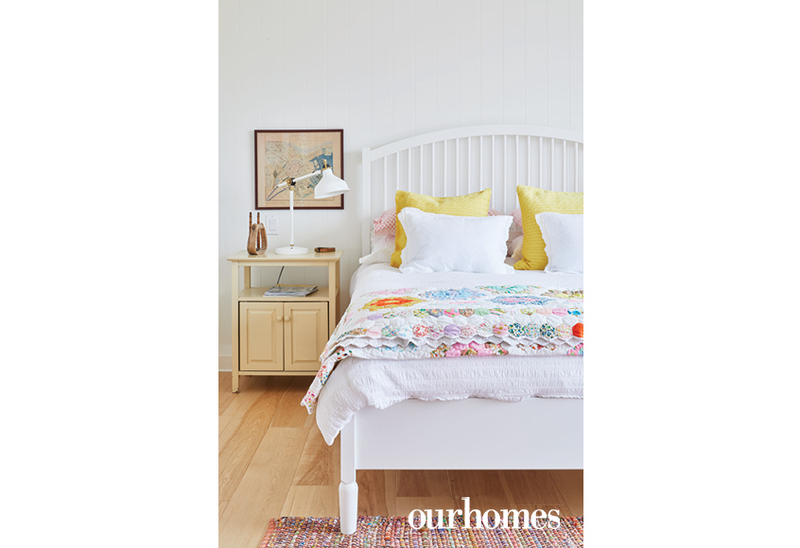 A cheery second-floor guest room is one of the many sleeping/ dreaming spaces in the house.